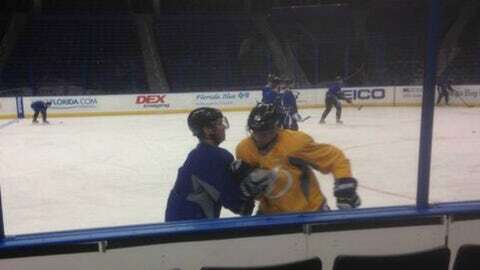 Steven Stamkos (yellow jersey) takes a light body check from teammate Martin St. Louis during Saturday's practice session. TAMPA, Fla. — Steven Stamkos continues to progress in his recovery from a broken right tibia and took light contact in the Tampa Bay Lightning’s morning skate Saturday. Tampa Bay’s star center skated for the first time while wearing a yellow jersey during drills at Tampa Bay Times Forum, further proof that he could be on track to make a return before possibly representing Team Canada in the upcoming Sochi Games. Stamkos, 23, took part in light checking with captain Marty St. Louis, and he also participated in faceoffs as Tampa Bay prepared to host the Colorado Avalanche on Saturday night. "He’s getting better," Lightning coach Jon Cooper said. "There are still lots of things that have to go on. He hasn’t been cleared. He’s still a ways away from being cleared. He hasn’t done any battling. The process is slowly going on here. In saying that, when you take the minimum/maximum of what the injury was, he’s closer to coming in at the minimum timeframe than obviously the maximum timeframe. That’s obviously good for all of us." Stamkos has been out since Nov. 11, when he sustained the injury early in a loss to the Boston Bruins at TD Garden. A 10-week X-ray was taken Thursday night, and he was pleased with the progression of his bone healing after results were revealed. He still experiences some soft tissue pain, and before Saturday, he had worn a red non-contact jersey in recent Lightning practices. "For a bit now, he has been coming on the ice and skating around," Tampa Bay defenseman Mark Barberio said. "He’s looking great. It’s all positive. It’s all good. It’s great when you see him everyday coming out and participating in practice. It’s all positive news for us." Stamkos, a two-time All-Star, had 23 points and 14 goals before his injury. The Lightning have performed admirably in his absence, and they entered Saturday tied for second place in the Eastern Conference with 65 points. With more progress like Saturday, Stamkos could have his impact felt again soon. "It was awesome," Lightning defenseman Radko Gudas said. "It’s great when you see a guy coming from injury and back in practices. It might take a little time, but there’s always a positive energy on the ice, for sure."